Father Charles Goes Down And Ends Battle. And here’s the first letter of each word with a sharp in front of it: F#, C#, G#, D#, A#, E#, B#. Here’s what that order looks like on the staff. Tells you nothing, right? The way the sharps are all scrunched up makes it impossible to know which one is G#, which is A#, etc. But look below and it gets a lot clearer. Makes it a lot easier when you spread them out. Notice how the order lines up with the acronym I showed you (Father Charles…). Now you know which letter goes with each sharp on the staff. For instance, you can see that the 5th sharp is A#. One more thing: the two horizontal lines along with the two vertical lines in the sharp symbol (#) makes a box where each note lives. The F# (first sharp in the order) is on the top line. You can see how that line is in the box. the C# is on the second space from the top, etc. This is good way to learn where some of the notes on the staff are. So now when you look at the circle of 5ths again, you can see that each time you go one step around the circle clockwise you add a sharp. Look at the 5-line staff beside the letter. You’ve been really patient. You’ve absorbed a lot. Now let’s put this new technology to work. Remember, we want to be able to write a song using the chords in any key. For that, you need to know the names of the chords in any key. Here’s how you do this. Step 1: Choose a letter from the musical alphabet. I’m going to choose A. We’re only dealing with major keys so far, so that means I’m dealing with the key of A major. How many sharps in the key of A major? Find “A” on the circle of 5ths. Beside it, you’ll see 3 sharps on the 5-line staff. What are the names of those sharps? Step 2: To answer that, look at the acronym for the order of sharps at the top of the page. Go through the order of sharps to the third letter (because we have 3 sharps in this key). That gives you F#, C#, G# (Father Charles Goes). 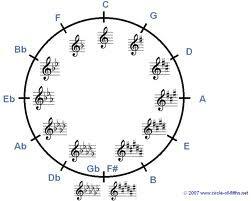 This means that the A major scale has the following notes: A B C# D E F# G#. None of the the other notes gets a sharp. Now replace the roman numerals with the A major scale. See how I stuck the F#, the C#, and the G# in there just like in the A major scale? Now you know all the chords in the key of A major. In every key the order of major and minor chords will be the same, just like above: major, minor, minor, major, major, minor, diminished.